Thanksgiving is a special time of year when the whole family gets together to enjoy some delicious food and some quality time with each other. When the whole family gets together, it is important to keep the kids entertained during the festivities. Activities and crafts for kids on Thanksgiving is a great way for family members to bond with the kids and for the kids to enjoy Thanksgiving Day. There are certain crafts that the kids can do that will allow them to participate in decorating, cooking the food and to help them understand the true meaning of Thanksgiving. There are also certain activities that remind children what they have to be thankful for during this holiday season. Getting your children involved will make for a memorable Thanksgiving for the whole family and help to make long lasting memories. Most families create a kid’s table and an adult’s table for the Thanksgiving dinner. Keep the kids entertained before dinner by placing some butcher paper on the table and create some pilgrim hats crayon cups to set out. 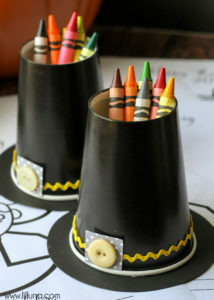 The Pilgrim Hat Crayon Cups are easy to make and the kids will enjoy pulling Crayons from this cute decorative addition to the kid’s table décor. For the cups you will need black paper cups, black cardstock, rick rack, scrapbook paper, buttons, hot glue gun, and an X-acto knife. Use the knife to carve out the bottom of the cup and then glue the rick rack around the rim of the cup. Glue a small square of scrapbook paper on top of the rick rack and then glue the button on the piece of scrapbook paper. Glue a circular piece of scrapbook paper on the rim of the cup. Once everything has dried, put the crayons into the cup. Place on the table and watch the children enjoy being able to be creative during the Thanksgiving dinner. Ask the kids to draw things that they are thankful for this holiday. The Thanksgiving turkey is the best part of the whole meal so why not let the kids pay homage to the main course? Play Dough turkeys is a great way for the kids to express their creative spirit by creating their own version of a turkey. Create some small balls of brown Play Dough for the turkey heads and larger balls of brown Play Dough for the body of the turkey. 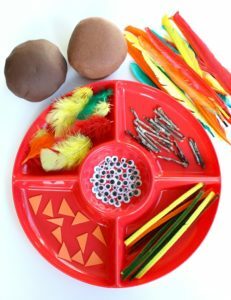 Buy some colorful long and short feathers, googly eyes, chenille stems, smaller orange triangles, and some small twigs. Lay the materials out so the kids can pick and choose what they want to use to create the turkey. Let the kids have free reign to create their own version of the Thanksgiving turkey. 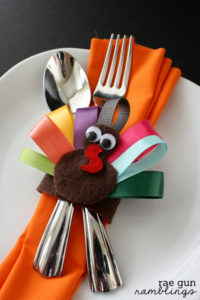 The kids can then use their turkeys as place cards for their seat at the table. Gratitude is an integral part of this holiday. It is important to remind the children what they should be thankful for during Thanksgiving. 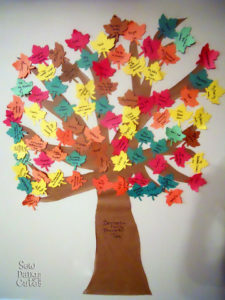 We wrote about the Thankful tree last week, this can also be turned into a children’s activity. Create a large brown tree trunk out of brown butcher paper with a lot of branches and tape it to the wall. Cut out different shapes of leaves from orange, yellow, red and green cardstock. Hand out the leaves to the children. They can use markers to write all the different things they are thankful for in their life and draw pictures on the leaves. Speak with them about why it is important to give thanks during this time of year. Help the children to tape the leaves to the different branches. Parents can also join in this activity by adding their own leaves with their items they are grateful for this year. If your children see you being grateful then it will teach them the importance of acknowledging and appreciating all that they have. 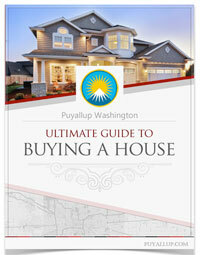 This is an activity that kids of all ages will love. Need help in the kitchen? Kids can help with this fun Thanksgiving appetizer that also doubles as a decoration. 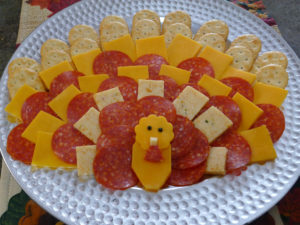 The Cheese Tray Turkey is a delightful way to arrange a cheese tray for a delicious appetizer. 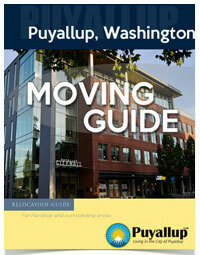 Buy your favorite cheese crackers, different types of cheese, and different types of salami. The best pairing for the salami is usually Colby jack or a med ium cheddar cheese. Let your child help you arrange the turkey. Start with a large semi-circle of crackers on a cheese board. Then layer a smaller semi-circle of cheese and then follow with another semi-circle of salami. Add another semi-circle of cheese and then another of salami. Finish off the turkey by making a turkey body out of a slice of cheese for both the body and the head. Add two peppercorns for the eyes and a folded piece of salami for the waddle. Not only is a cheese tray delicious but it also will be a fun activity for your children to help keep them busy during the day. Letting the kids help to decorate the table with their own crafts is a fun way to get your kids involved in Thanksgiving Day festivities. Turkey Napkins Rings are an adorable addition to any table décor. Head to the craft store and pick up some brown felt, ribbons that are different colors and sizes, red rick rack, googly eyes, and a hot glue gun. Cut your napkin rings pieces from the brown felt. One piece will be about 5 inches by 2 inches and another piece is 1 inch by 2 inches. Draw a line of glue along the short ends of the shorter piece and wrap that around the bigger piece. Then draw a line of glue along the short ends of the long piece and attach the ends together to form a ring. The smaller piece on the outside will be used for the turkey. Cut out the turkey body from the felt. Cut out one piece that is a larger circle and a smaller circle together. The smaller circle is the head and the larger circle will be the body. Cut different lengths of the ribbon and fold them in half. Glue the ends together to create the feathers. Glue those feathers to the back of the body of the turkey. Glue a few layers of ribbons to the back of turkey. Glue the googly eyes to the head of the turkey and glue a small piece of the rick rack for the turkey waddle. Once the turkey is complete, glue it to felt ring. Viola your napkin ring is done! Let the kids help to decorate the table with their new napkin rings. These activities are a great way to spend Thanksgiving Day with your children. Now more than ever, we should give thanks for our family and friends. Take the time to give thanks for those around you and those who support you. It can be easy to get caught up in the stress of the holiday so try to set aside some time to truly enjoy the day with loved ones. Enjoy your Thanksgiving and if you are traveling make sure to check our Twitter for travel updates!